Histology is the study of the microscopic anatomy of cells and tissues of plants and animals. 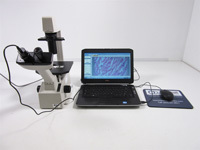 Here at Marshall Scientific we sell equipment that can be help aid in the running of histology based experiments. The equipment that we sell related to the histology field include: cytocentrifuges, rotary microtomes, and slide warmers. The manufacturer brands that we carry include: Fisher Scientific, Shandon, and Leitz. Please take a look at some of our histology related equipment that we currently have in stock and feel free to give us a call or send us an email if you have any questions. Up to 24 samples in 12 chambers. Can also utilize micro titer-strips. Olympus CK-30 Binoc Phase Contrast Tissue Culture Microscope with 10X and 20X Objectives. 6V, 30W Halogen Illuminator. The CK30 is a cost-effective inverted microscope suited to routine applications in a range of fields-from tissue culture and embryology to immunology and pharmacology. Sound design and simple operation makes the CK30 a fine choice for basic laboratory settings.